Ep.9: "The Sea Slug Slugger"
Ep. 9 Reward challenge: "Gone Shootin'" - Wendell almost single-handedly beats the entire orange team, 4-4, and Laurel's two hits secure the win, giving the purple team a trip to the Outback Steakhouse "Tiki Taco Hut." Ep.9 Ghost Island attendee: Orange draws rocks, Jenna goes to GI, gets the "no game" urn. Camera leaves. Ep.9 Immunity challenge: "Fijian Feast" - Angela displays a hidden talent for gulping down sea slugs, wins. Ep.9 voted out: Michael plays his idol, voiding seven votes against him, and temporarily saving himself. Libby is next, with four votes, and is sent to the jury over Wendell (one vote). Notes: Michael's idol play erased the second-most votes ever in a single play (7, tied with Russell Hantz in Samoa and Jenn Brown in Worlds Apart, behind only Kelley Wentworth's 9 in Cambodia). - For scoring on the IC, Kellyn and Libby each missed the second round by mere seconds, so they were scored as tied for 7th place, while the remaining first-round eliminees tied for 9th place. 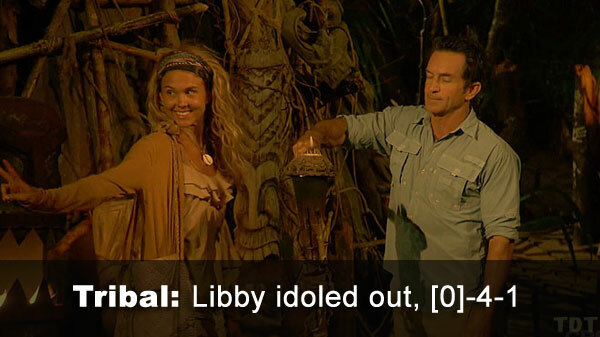 - Libby received 4 votes, from Angela, Chelsea, Kellyn, and Laurel (idoled out, -4-1). 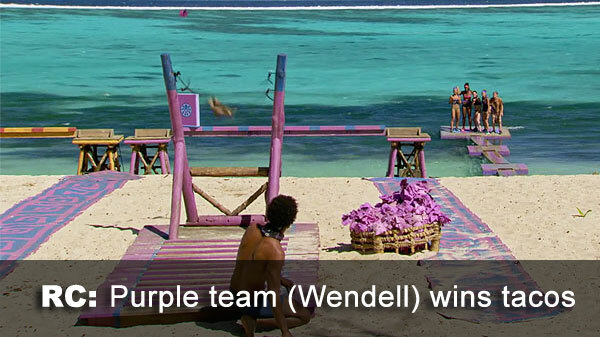 - Wendell received 1 vote, from Michael.